This product features a 7-inch WVGA Color display with a resolution of 480 x 800-pixels. It has CHIRP technology integrated which is a standard for every high-quality Garmin product. The depth capability of this unit is 2300 feet in the fresh water and 1100 feet in salt water. It also has a GPS with a waypoint system. The quality of this product is excellent, and the affordable price is what separates it from the others on the market. The Striker 7SV is Garmin’s latest product aimed at being entry-level regarding price but vigorous regarding features. While it maintains its affordability, it offers impressive features. People often make a common mistake of overpaying when they’re buying something. Fish finders come with various price ranges, but, you shouldn’t aim for the higher price just because you think that dictates the quality. The thing that boosts the price the most is the additional features. Before buying a fish finder, you should revise your reasons and demands. You don’t want to purchase a pricey product only to find out later that you don’t need half of its features. This product offers GPS, DownVu, CHIRP, and SideVu technologies. In other words, this thing has everything you need on a boat. Although having GPS isn’t a necessity nowadays, it’s not bad to have one either. With GPS your movement is constantly monitored, so you know exactly what your position is, at any given moment. Also, you can make and mark individual waypoints with high quantities of fish and return later to the same position. You wouldn’t be able to track fish migration and movement without the GPS. The reasons to buy a fish finder with GPS integrated are evident. Many people make a mistake of purchasing a fish finder without a GPS, only to purchase a separate GPS device later. If you’re in need of GPS and you have a reasonable budget, we advise you always opt for a fish finder with a GPS feature integrated. Not only will you be able to mark particular waypoints, but you’ll also never get lost when fishing in unfamiliar waters. The screen is quite big and easily readable. 7 inches of the display surface is more than enough to get an insight of what’s going on below the vessel. You will be able to distinguish certain forms and shapes with ease thanks to the wideness of this screen. The resolution is quite solid. The impression a 480 x 800-pixels resolution leaves is great. The quality is top-notch. Also, CHIRP, DownVu, and SideVu add up to the overall quality of the readings and the visual presentation on the screen. Standard sonar sends one frequency at a time. Since the only feedback is from this one single frequency, there is little information limiting the clarity and resolution available. However, CHIRP Sonar sends a wave of constant frequency thus getting a lot more information and producing a clearer image of what’s going on in the water. CHIRP Sonar has the sensitivity to offer much better target resolution, clarity, and details than any other standard sonar system. CHIRP technology also improves the performance of DownVu and SideVu scanning sonar to provide the clearest sonar readings. The combination of these three elements results in impressive readings and great visual presentation of the situation in the water. The frequency of a sonar beam reflects the number of signals that leave the transducer during a particular time interval. You should choose a frequency based on your specific needs. If you want to monitor your bait while you’re actively fishing, you should choose the narrow 200 kHz beam. If you’re scouting for fish and inspecting the terrain, and you want the broadest coverage, use lower frequencies. Depth penetration of 2300 feet is more than enough for an average fisherman. Waypoints such as docks and natural spots can be noted on the maps for additional guidance. As we said, the GPS is the main thing that makes this fish finder a great one. That being said, the 7-inch display offers excellent readings. Various 2D sonar functions are available, such as A-Scope, Bottom Lock, Split Zoom, Flasher, Fish Symbols, and so on. It has an adjustable LED backlight so that you can see clearly by day as well as by night. You also get a protective cover included which is a nice feature. This fish finder is waterproof. It’s quite straightforward and easy to install. You don’t have to hassle with redundant cable managing; everythingis neatly packed. Like every other product, it has its downsides. One of them is that it doesn’t have an SD card reader. It cannot copy waypoints from other Garmin devices and resets the settings with every shutdown. Also, it doesn’t have NMEA connectivity. This fish finder does not include a bunch of unnecessary features such as advanced chartplotter functions, sonar recording, SD card reader, and so on. Instead, it provides CHIRP technology, SideVu, and DownVu and yet maintains its affordability. To put it in simpler words, this fish finder cuts navigation and connectivity to a minimum but thrives in sonar features. The transducer is included as well, so you don’t have to purchase it separately. Whether you’re a passionate fisherman or an amateur, this fish finder will make a significant change in the way you fish. Overall, the price-to-quality ratio of this product is what makes it great. 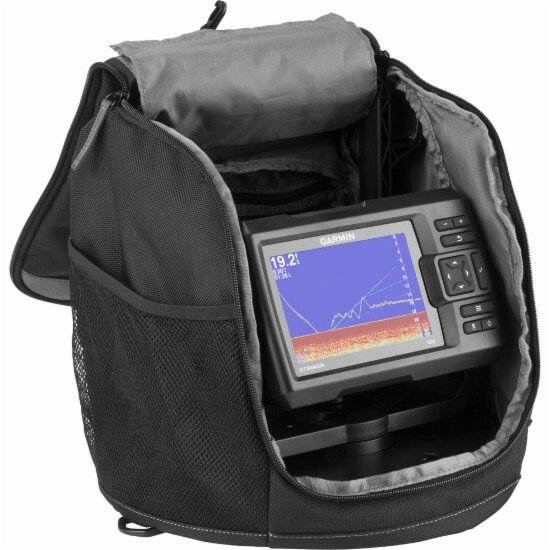 This device is one of the most affordable, if not the most affordable 7-inch screen fish finder with SideVu you can get on the market at the moment.